Every, J.L.R. (2009). Neotropical Stemonuraceae. Evergreen shrubs or trees, stems with indumentum of simple hairs. Leaves simple , alternate , distichous , margin entire , primary venation pinnate . Inflorescence axillary or cauliflorous compound cymes, short panicles or thyrsoid; peduncles bracteate. Flowers unisexual (plant dioecious ), actinomorphic , pentamerous; calyx cup-like, flaring at base; corolla lobes free , adnate to calyx . Staminate flowers with stamens equal to number of petals, alternipetalous, free ; filaments with dense, white, club-shaped trichomes on inner surface, pistillode present, ovary rudimentary sunken into large fleshy nectary . Pistillate flowers with ovary superior , 3-carpellate, unilocular, disc kidney-shaped, of pulviniform tissue around the ovary , stigma sessile ; ovules 2, pendant, apical. Fruit oblong , laterally compressed drupes with appendage oily, brightly coloured, ventral side white, dorsally green. Seed 1. Costa Rica to Brazil and Bolivia. Club-shaped trichomes on the filaments that are conspicuously exserted in the opened flowers. The flattened drupe often with a brightly coloured appendage. Discophora froesii Pires: leaves densely pubescent with long and erect trichomes; blades narrowly ovate to lanceolate; secondary veins 10-13. D. guianensis Miers: leaves glabrous, if pubescent, trichomes shorter and more adpressed than above; blades oblong, narrowly oblong, ovate, or narrowly ovate; secondary veins 7-10. D. montana R.A. Howard: differs from D. guianensis in its smaller drupe, c. 1 cm long, and leaves with a long slender point; in lowland rainforest below 500m alt. Placed in the Aquifoliales as sister to the Phyllonomaceae. 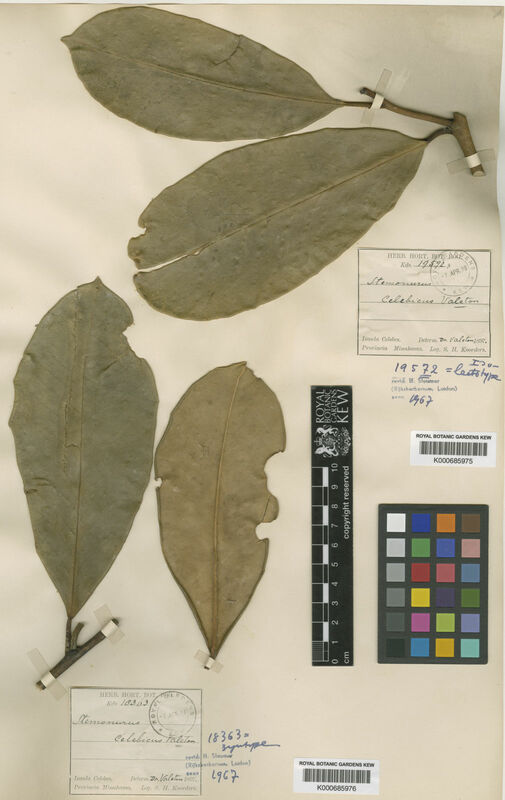 Formerly included in Icacinaceae but recognized as a distinct group on evidence of wood anatomy. Recent morphological and molecular analysis has maintained the distinctiveness of the group. See also separate family webpages for Icacinaceae and Cardiopteridaceae. Howard, R. A. and de Stefano, R. D. 1999. 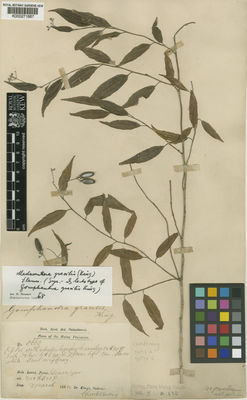 Icacinaceae. In: Steyermark, J. A. , Berry, P. E. , Yatskievych, K. and Holst, B. K.. Flora of the Venezuelan Guayana, volume 5, p.650-51. Missouri Botanical Garden Press, St. Louis. Kårehed, J. 2001. 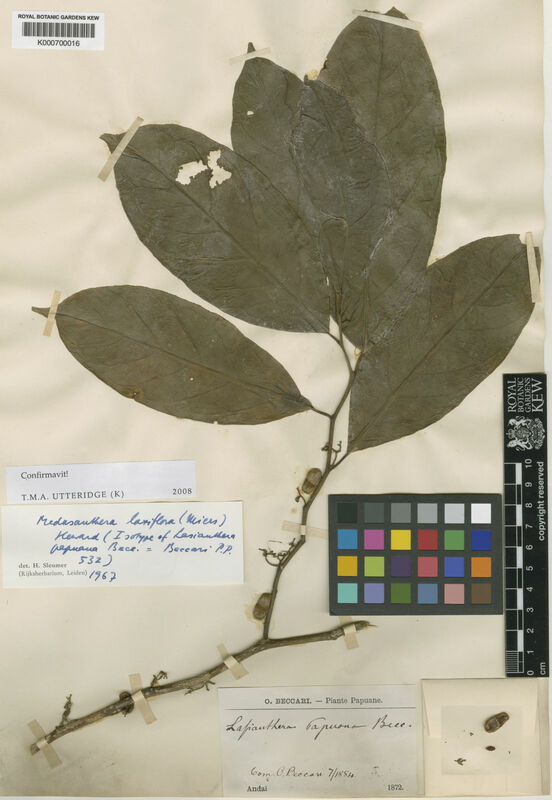 Multiple origin of the tropical forest tree family Icacinaceae. American J. Bot. 88: 2259-2274. Maas, P. J. M. & Westra, L. Y. Th. 2005. Neotropical Plant Families. 3rd ed. P. 132. A.R.G. Gantner Verlag K.G., Ruggell. Pennington, T.D. 2004. 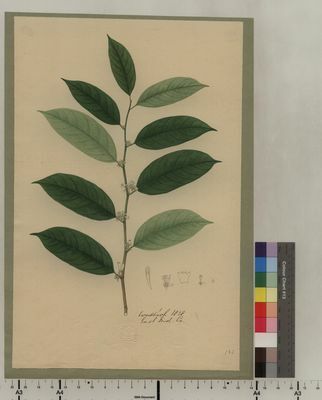 Illustrated guide to the trees of Peru, p.464. David Hunt Press, Milborne Port Sherborne. Roon, A. C. de and Mori, S. A.. 2002. Icacinaceae. In Mori, S. A. , Gracie, C. A. , Cremers, G. , de Granville, J. J. , Heald, S. V. , Hoff, M. and Mitchell, J. D. Guide to the vascular plants of Central French Guiana, part 2. Dicotyledons, p.360. The New York Botanical Garden Press, New York. Stevens, P. F. (2008). Angiosperm Phylogeny Website. Version 9 onwards. http://www.mobot.org/MOBOT/research/APweb/. Utteridge, T.M.A., H. Nagamasu, S.P. Teo, L.C. White, and P. Gasson. 2005. 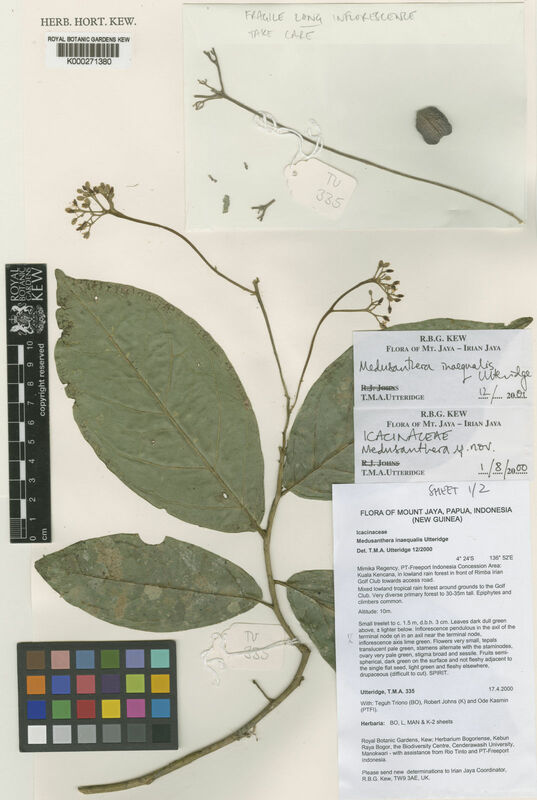 Sleumeria (Icacinaceae): A new genus from northern Borneo. 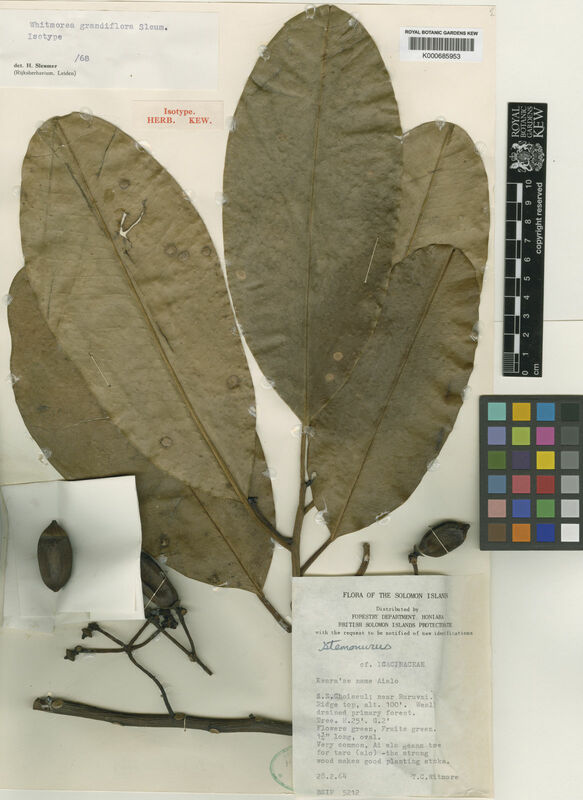 Systematic Botany 30(3): 635-643. Utteridge, T.M.A. and Brummitt, R.K. 2007. Stemonuraceae. In: Heywood, V.H., Brummitt, R.K., Culham, A. and Seberg, O. (eds.). Flowering plant families of the world, p. 310-311. Kew: Royal Botanic Gardens, Kew.